This is a book for five to nine year-olds. It addresses their fears and helps them see how to overcome them. And it manages to help children by using rhyme; it is somewhat like an illustrated poem for children. As one teacher who read a manuscript of the work says: " The rhythm and rhyme give it a familiar "Dr. Seuss" feeling. It treats an important issue for children in a way that is appropriate for children and easy for them to understand. Outstanding!" It makes an important point without sounding too preachy or teachy, which isn't always easy to do...It is good for prediction, too. I found myself wondering what the big lump was going to turn out to be ( I thought it was fear, which I guess was close). I will see if my kids will guess it. I think it will also lend itself well to further discussion "lumps" each of us carries around with us? "It was really cute; I liked it." "I think she will become a really good author." Now, John is a good predictor of success. It just did not know it. 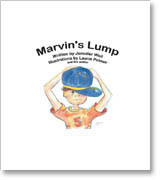 The author has written several works; however, it is this one that she is focusing mainly for children to help them cope with a real issue for children.